Can You Guess the Most Searched Puppy in 2014? 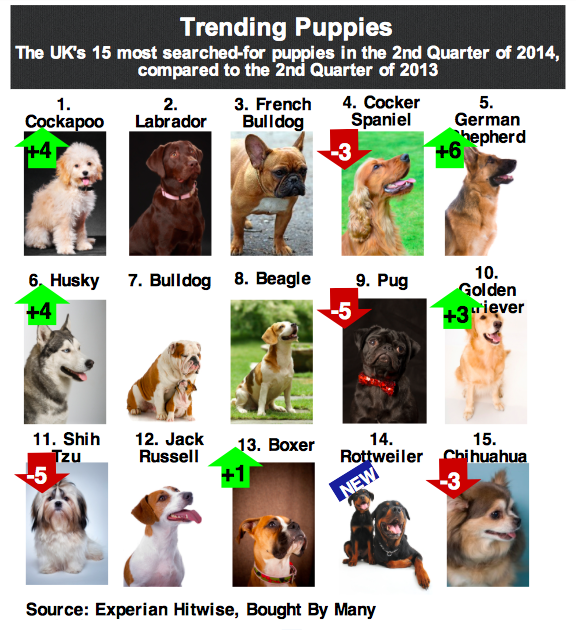 Financial service startup Bought By Many recently created a research report listing the most searched puppies in the UK in 2014. Can you guess what’s number one? We couldn’t… The results will surprise you. This year there is a brand new puppy in first place. The brilliantly named Cockapoo has grabbed the nations attention this year and has been named the UK’s most searched puppy.A mixture between the Cocker Spaniel and the Poodle, these pups have knocked the Cocker Spaniel off the top spot to number four. German Shepherd puppies have seen a surge in popularity in 2014, rising six places to 5th, with Husky, Golden Retriever, and Boxer puppies also making gains. Meanwhile, Chihuahua, Pug and Shih Tzu puppies have all seen a decrease in popularity. Surprisingly Rottweiler puppies are the only new breed to enter the top 15 and have displaced Border Terrier Puppies who previously occupied the 15th Spot in 2013. Evergreen favourites like the Labrador, Jack Russell Terrier, and the Bulldog have all held their positions, along with Beagles and French Bulldogs.